Update: This week is another pet battle bonus event and Squirt should be in your garrisons on Wednesday — that’s tomorrow! For additional info and some strategy, keep reading! 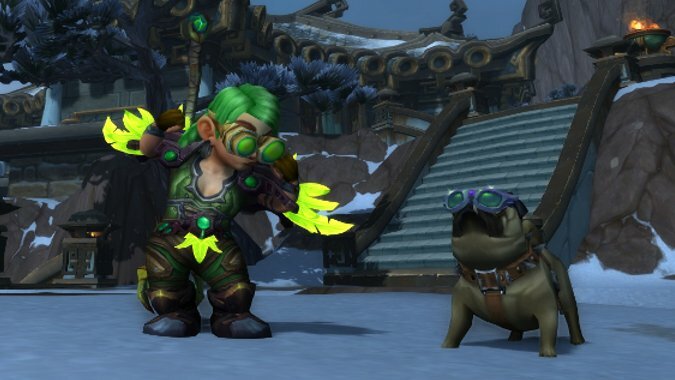 As the calendar shows, this week in World of Warcraft is the battle pet bonus event. Every six weeks there’s triple pet XP everywhere you do battle, plus a quest to do some PVP battles. But every few months, the stars align with the Menagerie rotation in a very special event. On this magic day — which is coincidentally today — every good little pet brawler will cash in their charms for pet treats, and hope there’s no lint in their safari hat. A while back, the dev team realized something odd about player behavior and the Menagerie. You could repeat the daily battle as many times as your heart desired and, because the Menagerie had an elevated XP multiplier, people did. Nonstop. It was basically the story of Narcissus, only with less moralistic hand wringing about vanity and more cute pixels. So, to save us from ourselves, Blizzard nerfed the XP from all the Menagerie encounters into the ground, except one. The team helmed by a little girl named Squirt is the lone holdout that gives this multiplied XP. Today, Squirt Day falls on the pet battle holiday. As always, Lio the Lioness or Serr’ah will give you quick healing for a pittance of silver and an extra XP boost from pet treats if you give them charms. Though the pet treat XP is 50% of the original number, not the 300% boosted amount, cutting out that travel time makes it well worth the purchase. Even without extra doodads, this is the most efficient way to level a stable of pets, bar none. If you’re not sure about the basics of carrying a pet and why this works (and what a carry even is) we’ve got a post for you. For Squirt, I usually use my Mechanical Pandaren Dragonling as my star player, with a swap to my carry pet on the first turn of Puzzle‘s run. You can carry two pets using the Dragonling, but I usually prefer to keep a random level 25 Undead on my team to seal the deal. If I mess up or get unlucky I prefer real time efficiency to per-match efficiency. I usually aim for level 10 pets as my carry, because Tyri will hit pets in the back line. Deebs doesn’t do too much here, you just need to take him out quickly. There are plenty of alternate team comps out there if you’re lacking a Dragonling. A Fox-style pet is easy to tame, and so is a Blighthawk. I wrote about this for WarcraftPets a few months back when Super Squirt day was active for Europe. Wowhead has several walkthroughs, plus a ton of suggestions in Squirt’s comments. Anne likes to use the team comp currently listed first on that page, with the Enchanted Broom and the Weebomination, but there are lots of teams there to try if you’re struggling. As an extra bonus, try hitting the Group Finder with a lower level character. Each pet battle grants a decent amount of player XP as long as your pets are all relatively close in level to their opponents. While it’s not the most efficient way to level, you might as well server hop to a high-level buddy’s Menagerie if you’re battling anyway. Don’t forget your Safari Hat!